Mention that you’re planning a visit to the Algarve Region of Portugal to most Europeans and they’ll nod knowingly and remark upon its reputation for having some of the most beautiful beaches in Europe. Mention that you’ll be going in the months of June and July to a native Portuguese and they’ll comment on the rates which increase two to threefold during the high season as well as the influx of people from all over Europe which triples the off-season population of approximately 500,000 permanent residents. In Portugal itself, the coastline is THE most popular holiday destination and it’s estimated that up to ten million people (Portuguese as well as millions of foreign visitors) vacation in the Algarve Region annually. It’s difficult to find affordable accommodations in June, harder in July as rates do a quick upward tick and by August, the pinnacle of the tourist season, it’s almost impossible. But, since we had to be somewhere in Europe during the early summer months and we’d read enough about the Algarve to pique our interest, we grinned bravely while looking at the rental bill, gulped a bit as we handed over our money and landed in the municipality of Albufeira, almost dead in the center of the Algarve coast. We never quite got the pronunciation of the sleepy little parish where we stayed, Ferreiras (Fer-RARE-as) correct but we developed a real affection for this wide-spot-in-the-road of 6400 souls (we weren’t quite sure where they all were) with a round-about that sorted people into four different quadrants and a charming railroad station (circa 1918) from which we shuttled east and west across the southern coast every few days to view a different destination. 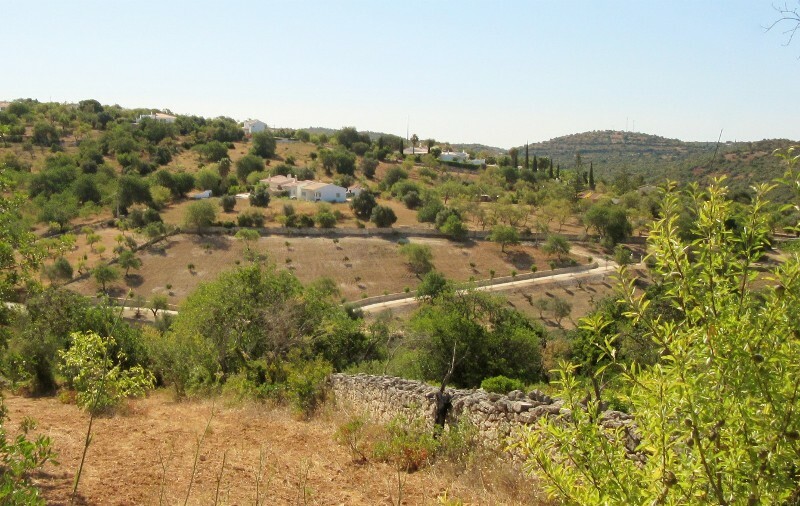 Located about 3 miles from the Atlantic Ocean, the surrounding countryside of Ferreiras is mainly agricultural with almond, fig, olive and carob trees. Gorgeously juicy oranges were abundant in the orchards and a bagful, sold at the side of the road, could cost as little as a Euro alongside some of the biggest lemons we’d ever seen. Since we were in the middle of the Algarve Region we were never at a loss to find a place to visit among the fifty plus parishes, villages and little towns dotting the coast and interior like undiscovered pearls with their Roman ruins and ancient bridges still being used to this day, castles, mosques built by the Moors, centuries old churches and walled cities. And of course, the Algarve’s hundreds of beaches, gracing the approximately one-hundred mile coast with their fine white and golden sands and coves, clear waters in vivid shades of turquoise and aquamarine, stunning rock formations and limestone bluffs that ranged from worn smooth and subtly colored to rugged precipices pocked with caves and hidden grottoes accessible only by water. 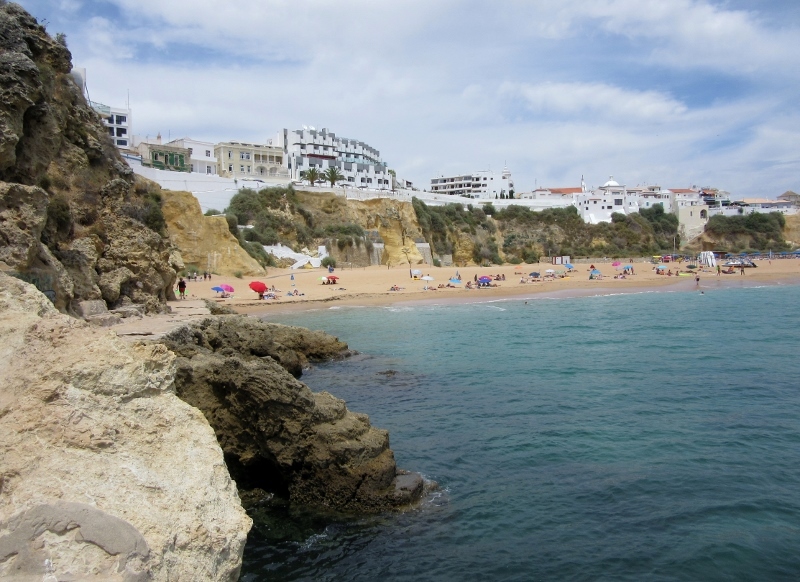 A favorite day trip of ours by bus and only 4 kilometers away was the municipality of Albufeira, famed for its beaches and one of the most popular coastal destinations in southern Portugal since the 1970’s. Originally it was a fortified Roman city, later occupied by the Moors (who gave the city its present name) for several centuries and then a quiet fishing village for hundreds of years. The heart of Albufeira is its old historic town with dazzling whitewashed buildings silhouetted against an intensely blue sky and mazes of steep and winding, narrow streets leading down to the sea. Alongside the cobbled streets are cafes, shops, bars and bistros and a central square, Largo Duarte Pacheco. Spreading out from the old town are tourist accommodations for every budget including ultra-posh resorts, five-star hotels and residential homes and condos as well as a recently built marina. Several outings to Albufeira to wander its charming streets, visit its beaches and people watch at the outside cafes were always topped with meals of local dishes like razor clams and rice, freshly caught fish such as grilled sardines and sea bass, roasted piri-piri chicken, spicy from the peppery sauce and the mouth-watering seafood dish we ordered whenever we saw it on the menu, cooked in a large copper pot, called Cataplana. We may have hesitated initially at paying the inflated rates for accommodations during the summer season but the Algarve Region has us convinced that the Portuguese know how to celebrate the simple pleasures of life. Everywhere we went we were welcomed by people who smiled and spoke a few words of English during a transaction or tried to help us with our mangled Portuguese pronunciations. And the beautiful countryside, beaches, historic landmarks and an abundance of fresh food beautifully prepared were always near by. We’re convinced that the Algarve Region lives up to all the hype and acclaim and is well-worth a visit at any time of the year. 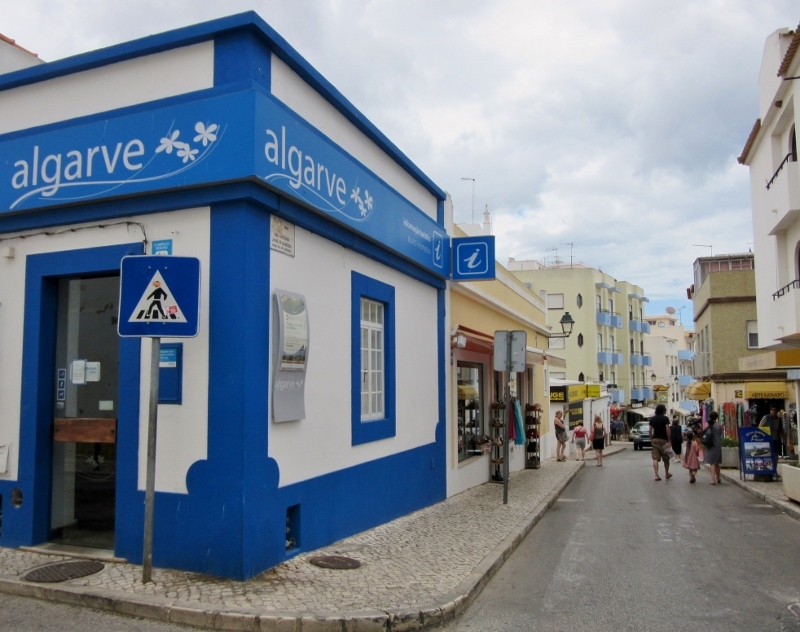 Next post: More on the Algarve from Sagres. The Algarve area is close enough to Seville that we had been planning to visit for the summer, but plans changed. We are still hoping to squeeze it in this year for all the reasons that you mentioned. My husband is pining for some beach time. Great write up, and really can’t wait to visit it now. You’ll love the Algarve region no matter which part you visit. Each little village and city that we visited had a distinct personality and the architecture was beautiful, both the old and not-so-old! And we need to do a reverse trip and travel to Seville. So much to see and learn there too! Let me know if and when you decide to come :-). The Algarve region seems like a great place to spend some time. I can’t believe we haven’t been to Portugal yet! We agree that the whitewashed buildings are gorgeous against the blue skies and floating clouds! And adding the Algarve region of Portugal to your must see list is a great idea! We’ve heard that Lisbon in August is pretty quiet and that both coasts in Portugal are magnets for its residents -hence the steep prices! I’ll be looking forward to reading your posts from Lisbon as we are hoping to visit this great historical and fascinating city in the not-so-distant future! That’s a great idea, Suzanne plus you’ll have the additional bonus of many choices available for accomodations. We were warned that the Algarve region gets very quiet during the off season as many of the businesses close down or have shorter hours but the shoulder season should still have plenty of things to do and see and there’s the added benefit that English is widely spoken throughout the tourist areas. I always wanted to visit Portugal but never got the opportunity. Your photos and description allow me to visit vicariously. Thank you. So glad we can take you along as a companion during our our travels around the Algarve. We’ll do our best to make your visit interesting and give you an interesting and fun tour! I’m reading your Portugal posts with great interest, I’m planning to be there this winter for a couple of months, and will be spending a lot of time in the Algrave. I haven’t decided where I’m going to base myself yet, so you’ve given me some ideas. For some weird reason your photos aren’t showing. Probably something to do with my computer/connection. I will drop back again to see the photos. So glad we’ve piqued your interest and hopefully, can provide some information too in the following weeks while we post about the Algarve Region. 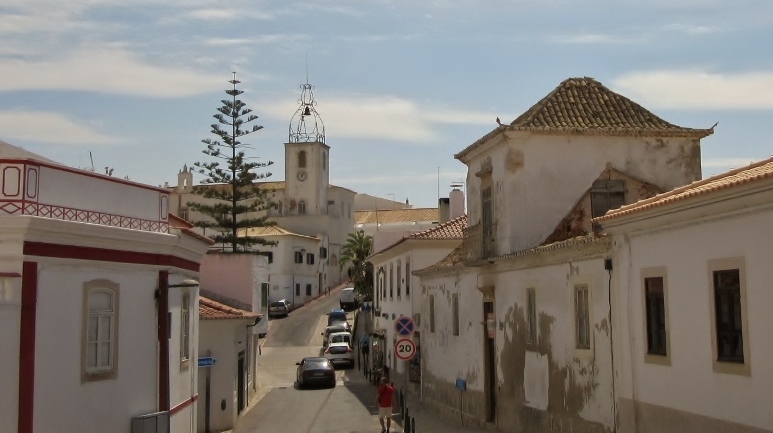 If you are planning to visit for a couple of months in the winter and are interested in the Algarve Region we would suggest Lagos which is on the coast and, although it may get quieter during the winter months, still has much to offer during the slow season and a lot of English speaking expats. Who knows, maybe we’ll run into you! P.S. Please let us know if you still have a problem with our web site … fingers crossed! You remind me it’s time to return to Portugal. It’s been a favourite of mine for years. Excellent golf courses in the Algarve, too. Many reasons to visit. We can definitely see why Portugal would be a favorite place for you to travel and it’s at the top of our list too. The people are very welcoming, the scenery is stunning and there’s something for everyone. As for the golf courses, we read that the Algarve has 42 golf courses in the region and several people that we’ve talked to have been quick to point out that many are some of the best in Europe and a few are world class. Makes us want to take up the sport! We have not been to Portugal yet (other than changing planes in Lisbon and napping with our heads on the table), but this sure looks like a great place to visit when we do make the trip. Portugal, because of its location at the far end of Europe (and maybe because it’s mostly small villages and has a rural feel) gets missed by lots of travelers, especially with the time limitations of the Schengen Visa.. And we have yet to see Lisbon except for the airport ourselves but we hope to fix that soon! Thank you for this post. I am excited now because our timeshare, Diamond Resorts International has two villas in Almancil, Algarve Portugal! Did you happen to go there? Is it as exciting as Ferreiras and Albuferra? I thought you were going to the US this summer! How great to have access to a timeshare in the Algarve region although we’re not familiar with Almancil. One of the things we liked best about the area was that, even with all the crowds, it could be as busy or as quiet as we wanted – in other words, we set the “excitement” dial and pace! And you’re right, we are back in the US for a bit while we work on a long term Visa to return to Portugal. Usually our posts are a few weeks behind our actual location! What a lovely place to be in the summer (even if you did have to gulp and pay the price). You’ve brought the Algarve to life for me and I am eagerly awaiting your next report! We agree that the area is beautiful and, even though we were there during the high season, it was fun to see what the buzz about the region was all about. 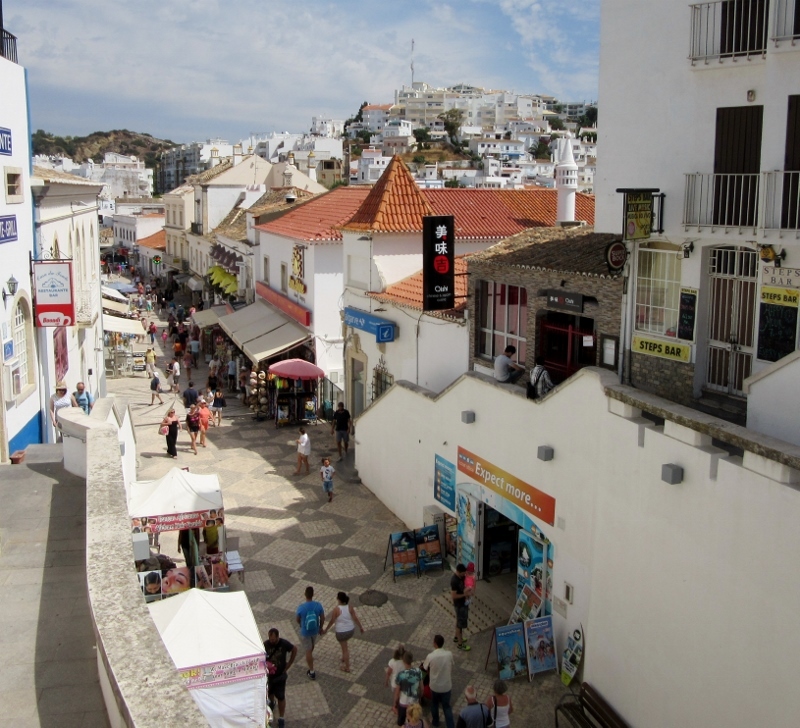 Albufeira is a pretty little tourist town with plenty of twisty streets to wander and lots of shops and great food. You can sit outside to watch the people strolling by (our favorite) or eat inside for a little ambience! You definitely peaked my interest for this region. I am wondering what it would be like during the winter months – December through February perhaps? We’d checked out the average weather temperatures ourselves as we’d love to see more of the Algarve in a different season. It looks like the coldest months are December through March with average temps in the 50’s and some rain. However, one of our favorite discoveries was that this area also has about 300 days a year with sun which promises lots of outdoor time! That sounds pretty good compared to winter temps here last year in the teens and twenties! It’s all relative – ha ha! When we lived in Montana years ago we would have agreed that those temps sounded balmy and after 3 years of very warm and tropical weather for our winters the Algarve’s cooler weather could be a nice change! This post sure brings back memories! I vacationed in the Algarve about 30 years ago. It was one of my most memorable vacations. The scenery was beautiful. I haven’t thought about this place for years. Thanks for bringing back some very happy memories. We’re so glad you enjoyed the post! I imagine if you were to visit today, Nancy, you might find that the Algarve is very similar to what you saw thirty years ago. It really feels like a step back in time when things move at a slower pace and strangers smile! This brings back so many memories. Fortunately we were there during the off season. We camped in Ferro, if I remember correctly. The campgrounds were tiny and filled with little RVs with white picket fences surrounding them. They must have been their summer vacation homes. Beautiful area. Thanks for the memories. So glad you enjoyed your trip down memory lane. There are a lot of recreational vehicles (or campers as we grew up calling them) in the area and camping seems to be very popular with several sites set aside for these vacationers. What has really surprised us is how clean the beaches and countrysides are – seeing litter anywhere is a rarity! Summer in the Algarve – you were brave! We are in the planing stages of our trip next year, and this spot looks wonderful. 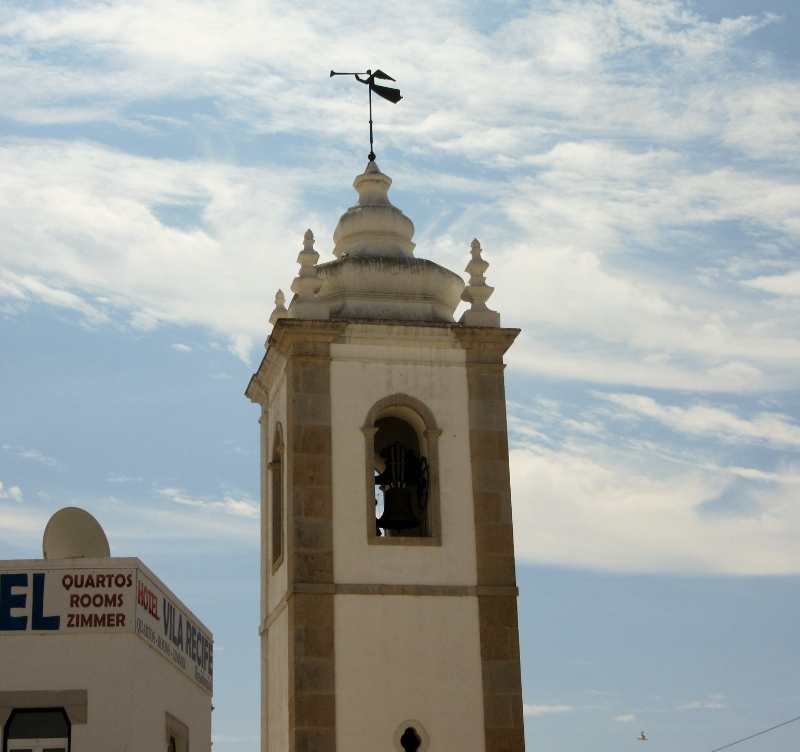 The Algarve Region is a beautiful and interesting area and definitely worth thinking about including in your itinerary. Our timing for our visit was off budget-wise and you might want to consider the shoulder seasons when the weather is good but the rates and summer crowds are less. That said, however, there were only a few occasions when we felt that the place was jam-packed. There’s plenty to do and see and it’s easy to avoid the masses if you want. I hope to visit Portugal some day. 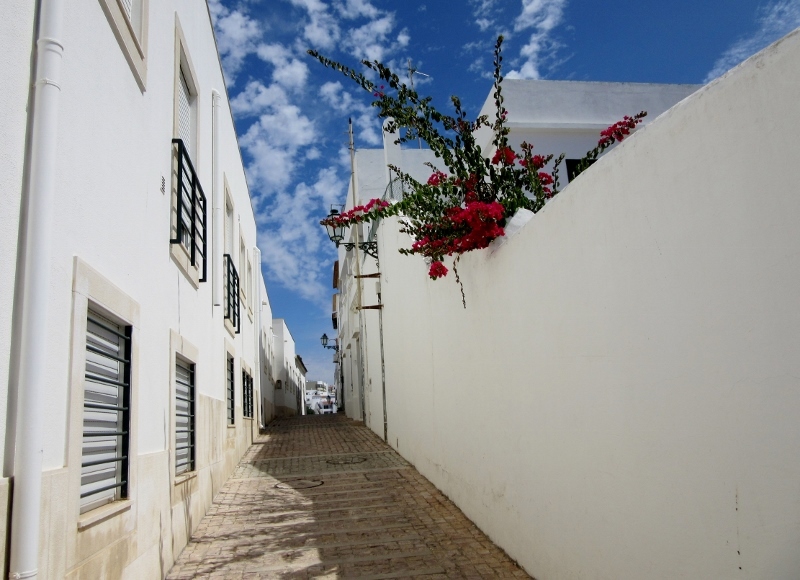 Albufeira looks very appealing with its white buildings and charming streets. A visit to Portugal and specifically the Algarve Region would be well worth your time, Donna. And Albufeira is a truly picturesque city,especially the historical part of town with it’s whitewashed buildings and narrow streets that are fun to follow and see find out what’s ahead! with a stay booked in Faro. Look forward to your next post. Thank you for visiting our blog. Sounds like you have a wonderful adventure ahead of you and that we need to take a look at the places you have booked. Portugal is a small country with a rural feeling but it’s packed full of beautiful scenery, fascinating history and wonderful people. You’ll have an amazing time! Monte das Figueiras for two days after which we drop off the car in Lisbon for our last four days. Love Lisbon and hope to visit Sintra. Wonderfully written and you have surely wet our appetite to visit. Can’t wait to read more about your adventures there! Thanks Eden and we’re looking forward to sharing more posts and pictures of this amazing area as well as planning for a time when our paths cross again and we can explore some of Portugal together! Thank you for stopping by and commenting. We love this area and are finding that it’s just as marvelous as “everyone” says! Looks like an awesome area. I can understand why you fell in love with it. Enjoy! !